Banners are something that can just tie everything together, at any type of event. I hoped that the colors here, brought some more Halloween colors into my party decorations and then I can leave this up until Halloween with a little bowl of candy! Well, in theory, because if candy was left out, it’d be gone in like two seconds! This was a simple project and was FREE! Are you guys sensing a theme here? Check out other FREE halloween crafts, here and here! 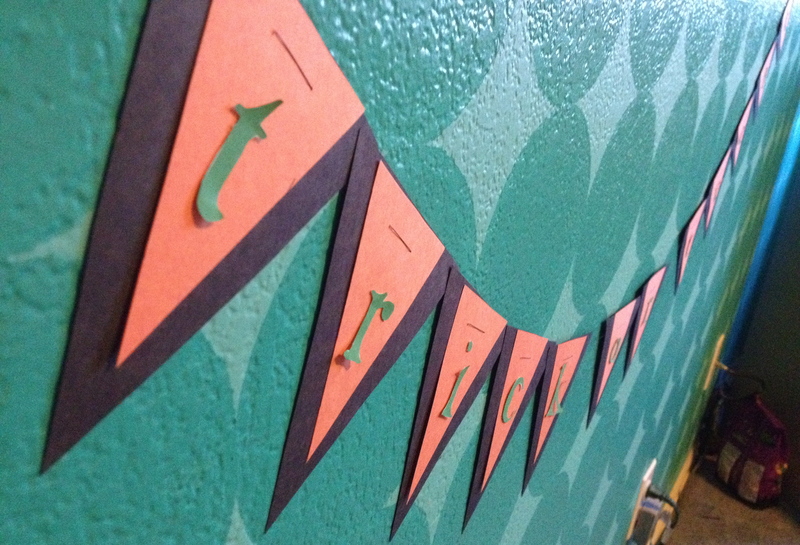 When I finished this banner, I wished I had Halloween themed paper and embellishments, for a fancier look. The options are limitless when it comes to style, shape, or fonts, colors! I decided to go with a triangle shaped banner, an orange/black/green look and sewed them together to ensure they would not go anywhere once hung up! This project took about an hour because cutting out the letters took a while, but it was simple besides that. Check back Monday to see where I hung it for the party!